Day 233: And Sometimes, You’ve Got To Enjoy The Moment . . .
Sundays are great days to sit around, relax and prepare for the upcoming week. It’s also a time to visit with family, friends or both. Last night we talked about visiting with Elaine and Sam and how much we enjoyed having them stay with us. We really had fun when Elaine’s Mom and Dad – P&L – arrived at the house around 11:30 last night! Yep, we’d been putting wood on the fire pit for a few hours and had settled in for a nice quiet evening, and that is where we were when they pulled into the driveway! It’s always cool to visit with folks that you just plain like to be around – such is the case of P&L – and so even though they were actually not supposed to be here until this morning . . . they made it last night. It says a lot about folks that are willing to get in a car at 10:00 at night and drive for an hour and a half. It says one of two things really – 1)Wow, those are some amazing friends and SO dedicated to seeing family – or 2)Are they slightly crazy? Getting in the car and driving for an hour and a half just to try some wine? While most people – in the sanity column – would easily choose number one. And why not? It makes sense. Those who know these folks are–well–they are number 2!! The good news in all of this is that we enjoyed some delicious wine. . .compliments of Jean’s adept abilities with the ring toss. You know, carnival ring tosses are usually good for a stuffed animal or two; well, we had the opportunity to play a ring toss for WINE at a recent event and even though we spent quite a bit of money–we spent less than the retail value of the wine! Tonight we enjoyed (and I mean really enjoyed) a 2008 Cask Cabernet Sauvignon from Francis Ford Coppola’s Rubicon Estates. And, even though we’ve had some really amazing wines during this blog, this wine really stands on its’ own. 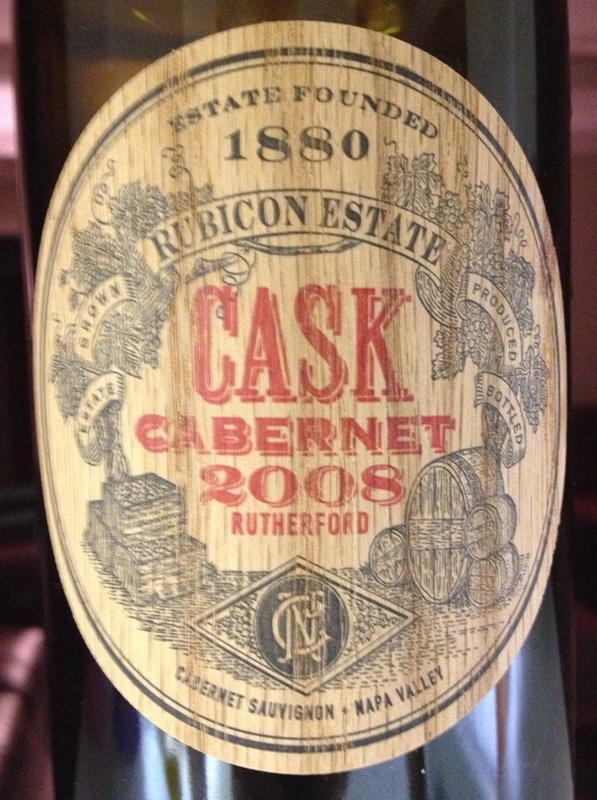 “Cask” is Rubicon Estate’s tribute to the style of Rutherford Cabernet produced by Inglenook Winery in the 1940’s, when it was regarded as the best in Napa Valley. This 100% estate Cabernet is aged for two years in American oak prior to release. It reveals a nose of currant, cherry, and earth. The palate is rich and full-bodied, with suave tannins, layers of creamy fruit and spice, and scents of tobacco and cedar on the finish. Smooth doesn’t even begin to tell the story of the finish. . .it was a fantastic wine! Wine Spectator rates this wine at 94 points and we couldn’t agree more. It’s a really good red wine–but it also has a higher than blogging price tag. As Sunday winds down and Monday is on the horizon, we pause to reflect on a terrific weekend with Elaine and Sam and P&L (NOT profit & loss!) We ended up with a terrific wine and even managed to sneak in some pizza tonight. We hope that you’ll figure out a way to get a hold of this wine. It’s a classic–in the making! Here’s to a much less eventful week – Please remember to enjoy your favorite wine responsibly and recycle whenever possible. Categories: Uncategorized | Tags: Cask Cabernet, Francis For Coppola, Francis Ford Coppola, Rubincan estates | Permalink.